New Pig, the world’s authority on leaks, drips and spills, has released the Walk Zone Safety Report, an in-depth look at slips, trips and falls in workplaces and public facilities. 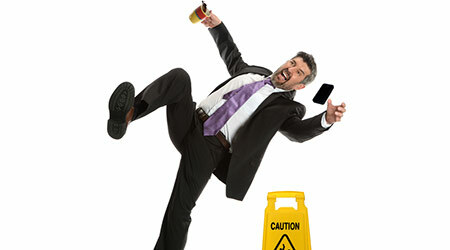 The survey included professionals in maintenance, safety, health risk and facilities management across multiple industries and found that many organizations underestimate floor safety risks and are unaware of high-risk walk zones that exist within their buildings, exposing them to significant liability, medical costs, productivity losses and damage to brand reputation. According to the U.S. Bureau of Labor Statistics, same-level slip and fall accidents are the leading cause of workplace injuries, totaling nearly 200,000 in 2015. And the 2017 Liberty Mutual Workplace Safety Index reports that these types of falls resulted in almost $11 billion in workers’ compensation and medical costs last year. • The number of risk zones is severely underestimated: Forty-six percent of respondents believe there are only 0-3 same-level fall risk areas in their facility. Yet, the survey revealed more than 10 different locations identified as common fall locations, highlighting the disconnect between perceptions and the true scope of the challenge. • Most risk zones are not being addressed: Ninety-two percent of organizations place floor mats in entranceways, while all nine of the other most dangerous risk zones go uncovered by the majority of organizations. • Popular solutions cause falls instead of preventing them: Nearly 15 percent of organizations reported that wrinkled, bunched-up or shifting rubber-backed floor mats are the primary reason for falls in their building. • Customer walkways are a major problem area: Less than one third (31 percent) of respondents reported placing floor mats in customer walkways, even as nearly one in four (24 percent) experienced falls in those areas. Also of note was that a majority of respondents (54 percent) were not aware of the final OSHA Walking-Working Surfaces rule, which took effect in January of 2017, providing employee safety standards for a wide range of workplaces. Only 29 percent reported meeting the rule’s requirements. Click here to download the complete Walk Zone Safety Report.